SAN JOSE, California – UC Irvin's hope of being Cinderella of the NCAA tournament ended Sunday in a disappointing 73-54 loss for Oregon. Nr. 13 Seed Anteaters had already shown some underdog potential when disturbed No. 4. Kansas State 70-64 last week in the first round of March Madness tourney. But No. 12 ducks proved too much for Irvine. Ehab Amin kicked Oregon out of a long drought to start the second half, and the ducks became the lonely double-digit seed to advance to Sweet 16. Oregon will play Virginia on Thursday in Louisville, Kentucky. 2 points and three steals. The Ducks has won 10 just after a weak start to the season and will play top-seeded Virginia in the southern regional semifinals on Thursday. After walking more than seven minutes without scoring to start the second half and exterminating a whole 12-point lead, Oregon used a 15-3 round to take control and finish a 17-win stroke for the 13- seeded anteaters (31-6). Amin started it with a 3-point and caused two conversions. Pritchard scored seven points in demand and the game quickly became a weaker one with Kenny Wooten getting a block at one end and a walkway at the other to make it 68-49 with just over two minutes to play. Robert Cartwright scored 14 points and Evan Leonard added 11 to UC Irvine, who entered the game with the longest active winning strike in the nation. The anteaters looked like a completely different team coming out of playing time with a 3-point from Cartwright on the opening possession. 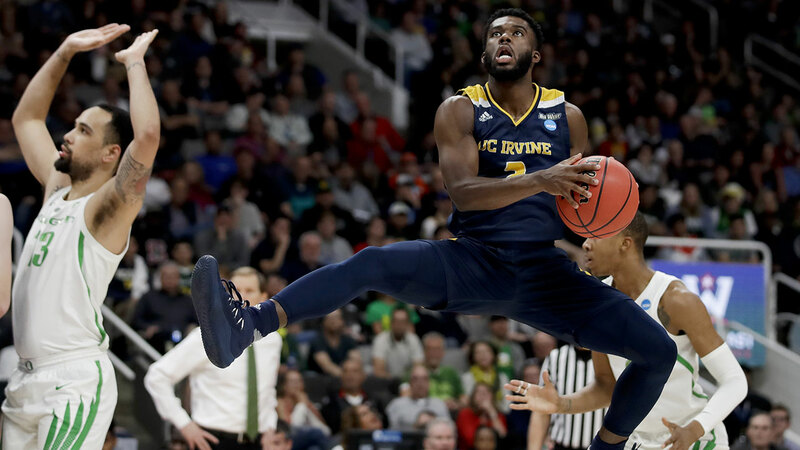 It started a round of 14 points in a row that put UC Irvine ahead 37-35 on a layup of Cartwright. The Ducks missed their first 11 shots from the field and committed four rounds before finally beating Amin's 3-pointer, ending a 7:32 drought. Amin then took a charge, and King followed with another 3 who put Oregon up 41-37 midway through half. Wooten capped 15-3 burst with an emphatic dunk that made it 50-40. The Ducks jumped at the top early and used a 10-1 race with an emphatic slam by the Wooten to take a 27-16 lead. They led 35-23 in the break. UC Irvine: The most successful season in Anteater's history has been reached. They set a school record for victory, won the Big West Tournament title and won the first NCAA Tournament victory in school history. They made a good fight against the more talented ducks, but eventually fell short. Oregon: Having stumbled together at 15-12 late last month after a three-game losing knit, the ducks look like the team ranked 14th in the preseason survey. With Pritchard as floor leader, Amin giving energy and Wooten patrolling the inside, they are back in Sweet 16 two years after making a Final Four run.